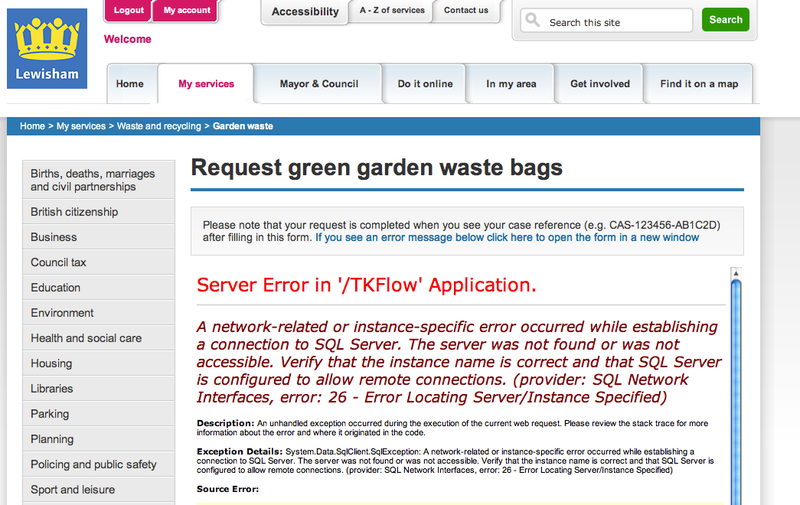 By running a web service, I should be able to access the council’s website out of hours. It’s a great idea, because it means that even when the staff aren’t in the office, I can still pay my council tax, or order some green garden bags. Except that I can’t. For some reason I always end up attempting this task at the end of a weekend. By which time their web services usually look like the screen grab shown above. Here’s what’s supposed to happen. You’re running some web apps. You monitor the servers that those apps are hosted on. You monitor their vital signs, (are the hard drives ok, has one of the power supplies gone a bit iffy, is it too hot in the server room), then you monitor the services running on that server. Finally you run some sanity checks on the actual web front end every so often. Can you still access the server, is the SQL database still accepting connections, etc etc. If any one of these things fails, someone in your team should be on call, and receive a text message. Then they proxy in, and fix it (or at least reboot something!). To do this, you use a wonderful system called Nagios. It’s free and open-source, but a bit of a pain to set up, but it’s also highly configurable. You can get it to only fire messages to your on-call person when two minor faults have occurred. You can set it to wait a specific number of minutes to see if a fault resolves itself. You can even start firing text messages and emails to the on-call person’s boss if it’s still broken after a couple of hours! If you work for Lewisham council, you should ask your IT people about this. It’s not that hard, and if it’s done well, it means that you’ll know about a fault before any of your users do. Please, for the sake of my untidy garden. Except that I didn’t. In my jetlagged state, I left the suitcase on the platform by mistake. I only realised by the time I’d reached Victoria. 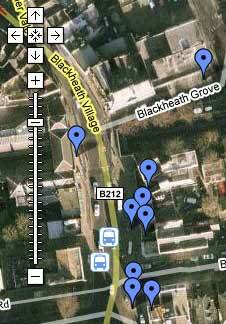 Blackheath station doesn’t have its phone number listed, so I phoned British Transport Police, and explained the situation. They put me straight through to Blackheath station, who went and looked for my suitcase. I rushed back there, and asked at the ticket office. “I was about to blow it up!” was the response! So, all in all, the system worked perfectly, the station staff were very helpful, and I got my luggage back! A good example of why stations should be staffed. The vegetarian bugle was sent to Coquillage, the local fish shop last weekend. I’m told the fish was great, so if you’re looking for something to set fire to on the barbecue this weekend, here’s what we did. 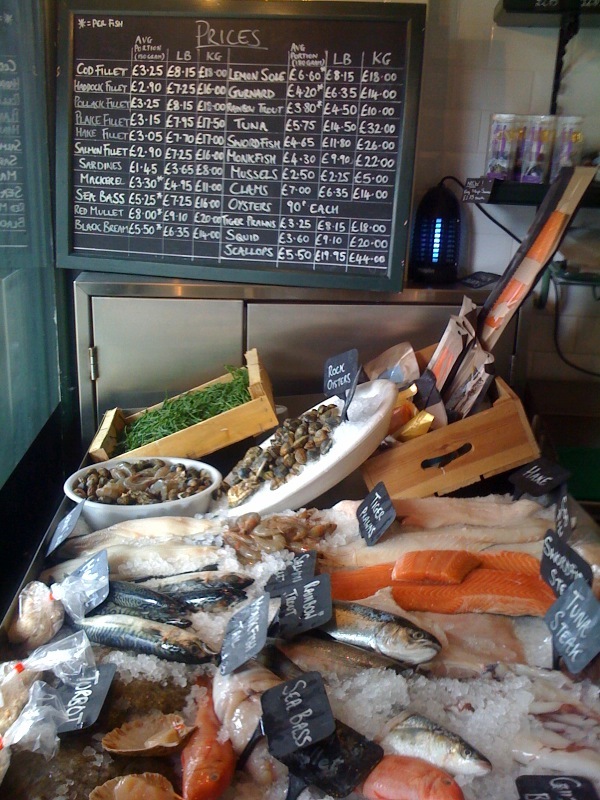 They also sell Samphire (green stuff at the rear left of the photo), which is really nice with a little lemon juice, as a green salad next to your fish. Very few places sell samphire, so this is quite a find! Whole sea bass, cleaned and de-scaled (they cleaned it reasonably well at the shop, but there was a little more to do). Stick it on the BBQ turning occasionally until it’s brown. – one of these helps (Sainsbury’s sell them too). Serve with samphire drizzled with olive oil and lemon juice. Anyway, it’s good to see them doing well, especially in a location that saw other businesses fail before.